This is all too convoluted and political for mere mortals to see where these powerful governmental opponents are leading us unless we look at history and examine those games of past governing regimes. In efforts to make some scene out of the USCOTUS ruling upon Obamacare by the 5 to 4 finding with Justice Roberts the ‘conservative’ appointment breaking the 4 to 4 party-line tie decision. I began thinking, running these confusing political ploys around in my mind and then I found this article by searching the term, “choose your enemies carefully”, it was buried on the eleventh search page, but I think it is very apropos today as the governing parties left and right in this country have taken nearly every ‘imagine’ and made them all apply to life in the USA, 2012. Orwell’s Nightmare: Imagine a Country Where. . . This is from a speech by former CIA officer Jim Marcinkowski, now running for Congress in Michigan’s 8th District. He was referring to the now dissolved Soviet Union, against which America presented itself as a vibrant and inspiring contrast — well, most of the time. We have become a nation led by those contriving fear, selling fear, validating fear, legitimated by fear — and we run the risk of becoming what we fought for decades. Funny thing here is that no matter which candidate is elected it is still the NWO candidate taking the USA further into the matrix of global governance. Seems we have between these a Hobson’s Choice. But friends, there are other choices which are not political and go outside that box……….. Just saying. Grave But Information is Freedom, Stay Free! Here is a lot of updated information on the state of preparedness in officialdoms who serve to protect. This is grave information, but freedom is preserved with information so do not be afraid to know. Take heart and share in matter of fact light sharing manner. Remember that cockroaches always scatter when you turn on the light unless you ignore them and let them overrun a place before taking your shoe and smashing them. Exposure to light always discourages vermin, don’t let them breed in secret, they won’t go away just because you shut your eyes. It is gross to see the first cockroach scurrying over your countertop or sucking the juices out of a cantaloupe as I experienced seeing several doing once on moving into a new home once upon a time when I turned on the light at midnight to get a glass of water. Seeing that grossed me out, but it put me into action to get the exterminator out who baited all around the house and in the cracks of the kitchen. Believe me, I didn’t want to pay the price of the service, but it was well worth it to be rid of those roaches and avoiding their infestation and keeping peace of mind for a drink of water and sanitation of my home being secured from vermin and bugs is priceless. In a parallel way this video gives unpleasant information that our society that is being overrun by the military industrial complex of corporations and bankers who have begun a bolder phase in their quest for living out in the open on our very kitchen countertops so to speak. If we act and clean them out now we won’t be forever afraid to get a drink of water or to live as free individuals. Yeah, this is corny, I know that, but it’s my plea for anybody out there who may not feel up to dealing with the not nice realities of this moment in time. My advice to every squeamish fearful person is to just take a deep breath and remember that turning away and running away from bugs just lets them multiply and soon you won’t have a home at all, so get going on your eradication plan. Pick up a ‘shoe’ or your voice to call for help because those bugs covet your cantaloupe too much to go away by themselves. God bless you and fear Him instead of mankind, right is might and no weapon formed against you can prevail if you stop being afraid of what you’ll see when you turn on the light. But environmentalists decry proposed text, citing lack of ambition, inspiration and commitment. 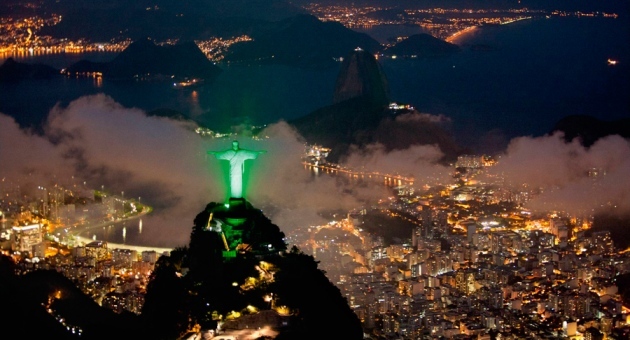 Rio de Janeiro’s iconic statue of Christ has gone green to celebrate the Earth Summit taking place there — but critics wonder if the agreement that emerged today is beyond redemption. (…) In the run-up to the Earth Summit taking place in Rio de Janeiro this week, Brazilian officials on 19 June unveiled a text agreed by negotiators that looks set to become the final agreement to emerge from the meeting. The 49-page document, which touches on all of the major issues surrounding sustainable development but requires very little in the way of concrete commitments from governments, will be taken up by world leaders when they gather at the 20–22 June Rio+20 meeting. Selected Highlights of Morano’s statement to UN: “What a difference 20 years makes. This is a mockery of where we were 20 years. I challenge UN activists, environmentalists, Greenpeace, and the media to ask Sec. Hillary Clinton what the objective here in Rio is for the U.S. Her objective is nothing more than to check a box and get the hell out of town. She is going to be conning people if you believe she is here for substantive agreement. We are witnessing an historic moment in history of UN. UN IPCC chair Pachauri is now saying global warming is but a secondary problem to sustainability. The UN is now saying saving species is a greater urgency than global warming. They have now thrown global warming under the bus in favor of species extinction. Failure here is good for the world’s poor people. Failure is the only option for this conference if you care about the environment and poor people. Carbon based energy has been one of the greatest liberators of mankind in the history of our planet. James Lovelock, the father of the modern green movement says “sustainable development” is “meaningless drivel”. Here he is at Rio+20 Maurice Strong 82 years old and make no mistake the old Green Godfather has many other plans for using the global corporations to create his dream of global governance. In the FOX video linked article; linked here. Strong acknowledges the primary powers of corporations over the still needed compliance of official governing bodies of the nations of the world. The FOX article; Godfather of Global Green Thinking Steps Out of Shadows at Rio+20 and the accompanying video of Maurice Strong’s long history of UN environmentalism to create global governance with the direct aid of the corporations of the world, mega financial banks as well as industrial manufacturers taking over the governmental institutions of nations through fractional banking and taxation of the labors and products produced by the mass of humanity worldwide. While Strong’s presence is low-key, there is no doubt the U.N. has brought him to Rio in an official capacity, if nothing else as a living relic of the successful 1992 Earth Summit, where Strong served as conference secretary general. Strong has recently described himself as a “senior advisor to the secretary general” of the Rio + 20 conference, a high-level Chinese bureaucrat named Sha Zukang, who is also a top member of the U.N. Secretariat. Documents examined by Fox News show that the Beijing office of the United Nations Development Program has paid Strong’s way, with a $13,000 round-trip air ticket from Beijing to New York to Rio and back. His hotels and living expenses are also being picked up, in what amounts to a three-week Rio + 20 junket. The immediate success of the conference in issuing signed documents of agreement has been lessened by the exposure of their agenda to cease all development, progress, and populations of the earth through carbon taxes which they would like to levy upon all carbon emissions worldwide especially the developed world. None the less it is the UN Agenda 21 that is the vehicle through which these elite movers and shakers at Rio+20 will continue their efforts to make inroads into the local communities of the world toward the goal of green global governance. New Scientist June 18_2012 Article linked here. I rather think that would mean a reduction of agriculture and food, and causing thirst and harm of living beings. I hope the scientists and their financiers will extrapolate life as more important than playing God to ‘help’ the earth with their experiments to cool the globe. This research is only possible through the public purse and is after all financed by the trusting unscientific mass proletariat through taxation of their labor and goods. It is cruel to violate that trust, cruel and criminal. Tread carefully because to whom much is given much is required of them. Here are video reports as the first attendees participate in the pre-convention convention of Rio+20 Earth Summit 2012, June, from Craig Rucker, CFACT. Marked-up draft of UN Rio+20 agenda reveals shocking “sustainability” wish list. An American family of four could owe the UN $1,325 per year. Here’s the goods that prove The Globalist Conspiracy, Hello! This may enlighten when you see names and look underneath their facades of US officials wanting “World Peace”, “International Goodwill”, Etc. Etc. Etc. (…) ‘WE ARE GOD’S GIFT TO MAN’ – A separate file of just David Rockefeller’s 1965 speech to the International Industrial Conference in San Francisco, wherein he concludes by boldly stating “What we are is God’s gift to man; What we become is man’s gift to God. ScienceDaily (June 6, 2012) — A geoengineering solution to climate change could lead to significant rainfall reduction in Europe and North America, a team of European scientists concludes. The researchers studied how models of Earth in a warm, CO2-rich world respond to an artificial reduction in the amount of sunlight reaching the planet’s surface. The study is published June 6, 2012, in Earth System Dynamics, an Open Access journal of the European Geosciences Union (EGU). (…) Emphasis added. More and more the Matrix of Hollywood propaganda becomes transparently clear. It is rather fascinating.